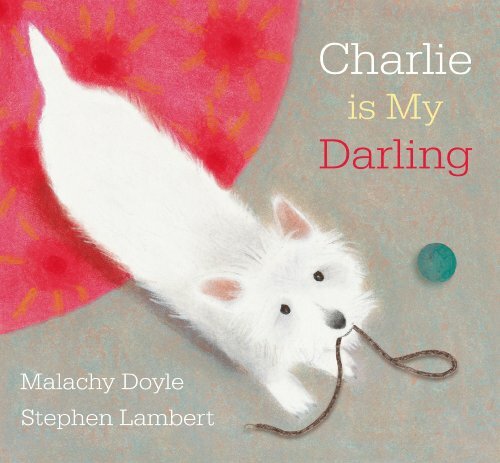 Told from the perspective of the boy who takes Charlie, a mischievous little dog, out for a walk – and then has to chase him all the way home when he runs off – this delightful picture book has soft, pastel illustrations of almost tactile quality. They are also busy with plenty of incidental details for young readers to pick out. Imaginative variety is provided between pages through the layout of the pictures and text while the spacing of the words encourages variety in reading speeds. There is a strong interactive element to the book, with the text often following Charlie’s winding path and a larger font is used for words such as ‘bark!’ encouraging young readers to participate in the telling of the story. Attention is held throughout with much action occurring on the far right hand side of the pages, propelling the reader forward and lending the story a strong sense of momentum. This charming and happy book will engross young readers with its effective integration of words and pictures. It also tells a meaningful story about the joy of friendship.